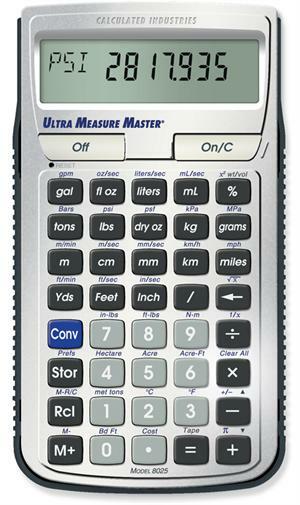 Professional Grade U.S. Standard To Metric Conversion Calculator - The Ultra Measure Master is the most complete and easy-to-use U.S. Standard to Metric conversion calculator available for Engineers, Arcitects, Construction Pros, Scientists and Students. Convert more than 60 imperial and Metric (si) units - over 400 conversion combinations with a touch of a few buttons. Forget complex scientific calculators or memorizing conversion formulas. The ultra Measure Master meets federal highway metrication requirements. *Note: (si) is the International System of Units, or metric system. Works in and converts between Feet, Inches, Fractions, Yards, Meters, Centimeters and Millimeters - including Square and Cubic formats.